Kombinera zipliner för alla adrenalinnivåer med djur möten och stranden avkoppling på Roatan Island. Välj mild eller extrem ziplining (eller hoppa över det hela), häng sedan med apor, sloths, papegojor, macaws och mer innan du snorklar och kopplar av på den vita sandstranden i West Bay Beach. Bekväm pick-up vid kryssningsfartygsporten eller ditt hotell ingår och en dvd av ditt äventyr är tillgänglig för köp. Highly recommend! My 77 yr old mom and 3 kids loved it. Driver Karin and guide Reina were awesome. All the Zipline guides were great, especially Brandon who stayed with my mom and helped her the whole time. Although we were not expecting much given the price compared to other cruise excursions, this attraction was not well done.1. This excursion is run by Victor Bodden Tours. At the dock, you will wait for about 30 minutes in the sun for your tour guide to take you to your bus. 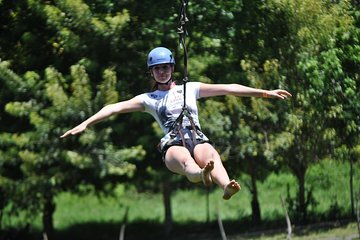 The trip to the zipline/monkey facility is run by Bodden tours and is short 15 mins or so bus ride away.2. At the facility is where the chaos first begins. Everyone unloads from the buses (say about 20 or so each bus) and everyone has to line up to be given a waiver to review and sign. There are a ton of people all waiting to sign forms. Then, everyone is intended to pay (which may be confusing if you have already prepaid). This process could easily be optimized by having people review and sign forms on the bus. Those who have paid could easily be given wrist bands prior to boarding the bus or actually on the bus.3. Once you have gone through the waivers and paid, you will either go to the zipline intro or straight to the monkeys (which is what we chose to "skip the zip"). 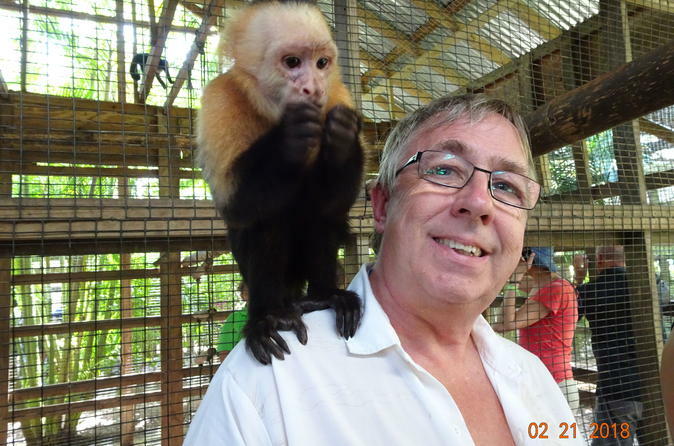 A tour guide leads you to about 5-10 cages where small groups of 8 to 10 people will enter to meet the monkeys or parrots. A couple of cages has about 2 small monkeys that appear to be especially trained to take pictures with you for a few seconds while being fed by the tour guide. The highlight of this tour is that they allow you to take pictures with a sloth or baby sloth for about 30 seconds to 1 minute. The part of the tour to meet the animals is over in about 20 minutes. But if you skipped the zip, be prepared to wait about 1 hour before the rest of the people on your tour group are finished with nothing to do. You will not be allowed back to look at the animals since there will be no tour guide available. 4. Once the zipline/animal tour is done, you will be bussed to a private beach called the Bananarama Dive and Beach Resort. It is there that we ate a $30 meal but somehow, when we went to pay, the bill came to $60 because the waiter "misheard" our order and instead of giving us cgave us other food - which may have been understandable, but he then add "tip" and "taxes" and the bill comes to double. We tried to dispute, but we could tell that this was part of their tourist scam and just angrily paid the bill. On the beach, you will be constantly solicited to pay for braids, food, tshirts, etc.Other than your tour guide (Annie? ), everything about this tour made us uncomfortable. Family trip with only one of us that has ever zip-lined before and let me tell you, this was so much fun for all six of us. Exhilarating and scary but safe and fun...and wow, so may zip lines...was not expecting so many. Preston and his team were fantastic...they made it fun and exciting the entire time but always made sure we were safe and secure. Definitely purchase the emailed photos after....great value and so many pictures. We received 3 emails of the photos just a few days later. Wow..fantastic purchase. After zip-lining our group really enjoyed the Sloths...so cute and friendly. This was a wonderful excursion and would highly recommend. Thank you Preston and crew for a great time. We had a great time taking this excursion while on NCL Getaway cruise. The zipline tour guide was awesome and goes above and beyond. The monkey and parrot experience was very up close and a lot of fun. The beach was a nice relaxing time with great restaurant if you are hungry. The road leading to the tour is long, bumpy, and full of potholes, but the driver we had was very sweet, and she stayed with us the entire day, so we had no worries about how we were getting back to the ship. She was extremely helpful with my dad's wheelchair and our bags, and offered to lock up the van while we were with the animals so we didn't have to worry about theft of our beach stuff. The monkeys, sloths, and macaws were awesome - I would have liked to have more time with them. It felt like we were rushed through to accommodate the large number of visitors they had that day, but I was thrilled to get to hold them all, and the guide was very informative as to how to hold them and gave lots of information about the species. I was happy to hear how the animals are rotated every other day, and only work until 2pm so they aren't trapped as though in a zoo. There were other animals there that we didn't expect to see, so that was a bonus. The beach was FANTASTIC - lots of shady spots, plenty of comfortable lounge chairs, beautiful hard sand beach, and plenty to do if you're into activities. We enjoyed relaxing and partaking in a few local beverages. I'd definitely be back to do this again, and recommend it to others. Place does not look like much to begin with and might be a little disorganized at first, but once we got going it was a great tour. We loved the zipline experience. The young men that worked with our group of about 15 that traversed the course with us could not have been better. They were very fun and safety conscious. They really made it work for everyone from old to young and from bold to timid. Everyone walked away very happy. The women at the front desk there were also very helpful. That said, we found Roatan a semi-difficult place to navigate. When we arrived at our meeting place, the manager wouldn't talk to us, made us wait without explanation while they sold other tours to people so our van would be full. It was very uncomfortable. When we returned later that day, we went to see the manager, because our day was simply not what it should have been. He was willing to talk and asked for our honest feedback - this was a different attitude from the morning. We told him we felt like our day was less than ideal. We learned that the manager had been angry with us that morning, as we suspected. He'd sent our group on without us before we arrived. Our documents said to arrive 1 hour after the SCHEDULED arrival time. We had checked when we docked early. Our ship had docked at 7:30 instead of 8, so our group had left at 8:30 instead of 9. We arrived at 8:35.He said we'd been late and caused the problem. We told him our perspective - that we'd checked the paperwork and arrived with ample time to spare. One of the other workers reminded him that they had this problem before and needed to change what was written OR how about honor what is written?. What ended up happening was that we were put in a van ful of people going to a beach resort for the day, rode to that resort, turned around and finally arrived our our zipline course. We were introduced to two women who had arrived in a Toyota Yaris and told we would go from there to the beach with them. We did the zipline course with them and others - very great people - and for the sake of lost time skipped the animal part. Drove with 5 people in an old Yaris to a beach for less than 2 hours. Met the driver and returned. The beach is a good beach with white sand and you have a clean bathroom and place to change. You can buy food and water and drinks - at an outdoor grill that was expensive. Our driver had stopped at a convenience store for us because one woman needed feminine products. There we picked up soft drinks and water. The roads in Roatan are falling apart, so our two drivers mostly spent their time navigating through or around huge craters of potholes. There was no narration of the island, culture or people. The various car drives took from 30-45 minutes EACH, as we crossed the hills and jungles of the island. On our return trip, we were halfway back across the island when all the traffic came to a stop and cars started turning around and heading back. They were re-paving the road up ahead and had closed it with no notice. It was a good thing we had decided to return an hour earlier than necessary or we would have cut it really close. Having chosen a cruise that goes to Roatan, the white sand beaches in the wesern Carribean are unsurpassed and the zipline was a treat. The infrastructure there is very poor and cannot really support the numbers of tourists when 3 ships are there at the same time. The traffic was terrible, the roads were worse. The island is poor. These are not reasons to stay away, they are just the truth. Everyone who worked with us asked for extra tips on the side, and I could not blame them. This is not Mexico. Adjust your expectations. They are still learning how to be a tourist destination. Wow!!!! How much fun was this! I have never seen my husband smile in all the time I have known him. We were in a group of 8. We loved the zip line so much we want to do it again. The Monkeys and Parrots were fantastic. The beach was over cast so we didn't do much there. No fault of the tour I would VERY MUCH recommend this tour. It was fantastic!!!!! great exciting although I did it once and now it is off the bucket list. you can be older but not too heavy for best experience.